Stairs are often the first to go when people get older. They shift their bedrooms to the ground floor or move to new homes to avoid the burden and risk stairs pose. Well, worry no longer. Scientists revealed Wednesday a hi-tech staircase that can absorb a person’s energy while climbing down the steps, and then use this power to assist a person’s ascent later in the day. This low-cost device — the details of which were published in the journal PLoS ONE — could help older people remain mobile and stay in their homes longer. “This a problem to a lot of older adults, who are still very healthy and active,” Karen Liu, a computer scientist at Georgia Institute of Technology and one of the project’s directors, said. The idea first blossomed for Liu at a scientific conference, where she was inspired by an ankle exoskeleton that assisted walking in people with motor impairments. Liu immediately thought of her mother — “the healthiest 70-year-old woman she knows,” but who always complains about walking up stairs. Liu thought her mother could use this exoskeleton to make such climbs less burdensome. But, this fix didn’t seem practical. Her mother wasn’t going to put on an exoskeleton just to get up the stairs. So, Liu thought rather than make technology to help her mother’s ankles, why not build something that forces the stairs to do the work instead. 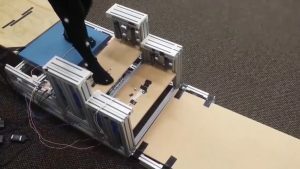 Upon returning from the conference, Liu approached her colleague, Lena Ting, a biomedical engineer at Georgia Tech and Emory University, to see if she thought the transfer of the technology from ankle to staircase might work. Ting’s response: No way. But, Liu persisted, so, a post-doctoral researcher in Ting’s lab — Yun Seong Song — went to work building a prototype. Assembled from a set of springs, sensors, latches and tread that only moves up and down, the steps are energy efficient and do not require a bulky motor. Instead, the modular stairs, which can fit on an existing staircase, recycle energy made from a user’s descent. Going down stairs is like a sequence of stopping yourself from falling, Liu said. Every time you brake yourself, you lose energy. The assistive stairs absorb and store that energy, then return it to the user when they walk back upstairs. “It feels like stepping on a cushiony surface and having it slowly bring you down,” Ting said. To assess their helpfulness, a group of healthy, young volunteers took the new stairs for a spin. A sensor on the top step measured how much work the trailing leg contributed to descending the stairs and how much the leading leg worked to go up the stairs. The subjects didn’t have prior knowledge about the technology nor were they provided with information about the purpose of the steps before using them. The technology reduced the workload during an ascent by 17 percent overall and the work of the knee joint by 37 percent. And to their surprise, the stairs descent served a dual purpose. Though the team intended the steps to merely store energy during a downward climb, the device also made going down stairs easier — with the subjects’ ankles working 26 percent less than normal. These reductions are meaningful in the amount of force the lower leg bone must apply on the upper leg bone at the knee, Max Donelan, a physiologist at Simon Fraser University, who was not involved in the study, said. “For an older person who has osteoarthritis … that can mean less pain and less progression of their disease,” Donelan said. For now the prototype consists of only two steps, which according to Donelan is a satisfactory starting point. The springs, sensors and latches for these hi-tech stairs cost less than $50 per step. In the exoskeleton field, there’s a growing recognition that proof of concept trials are necessary. A demo of the energy-recycling stairs that store a user’s energy during descent and return energy to the user during ascent. “The more complicated part of the equation isn’t the device you built from scratch, it’s the user,” Donelan said. Steve Collins, a mechanical engineer at Carnegie Mellon University, who was not involved in the study, but whose ankle exoskeleton design catalyzed the project, agrees. “It’s a promising initial result that suggests we should put more thought into the development of these kinds of systems,” he said. The prototype is still limited in other ways. For instance, the current model can only be used by one person at a time. The springs cannot store energy from more than one person’s descent. A user must first descend the stairs to load the device with energy before it can assist them up the stairs. In the future, Liu and Ting want to build a full flight of stairs and eventually try them with an older demographic. But they see the potential of such stairs to also aid people recovering from knee surgery and for pregnant women.